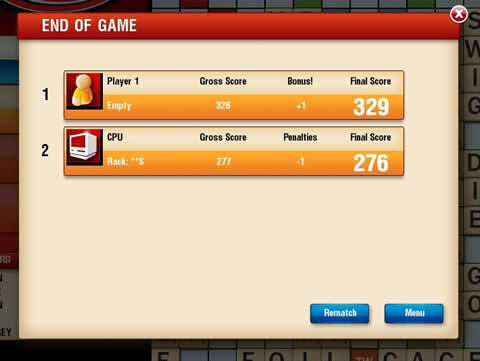 Scrabble Game Review - Download and Play Free Version! You can play against the computer or other players. Provides a good number of options to customize your game. You can only save one game at a time. Doesn't quite capture the feeling of the original board game. The most popular word making board game is back for play on your PC! Now you can play Scrabble whenever you want without the need for other players as you face off against the computer. Customize the difficulty to your desire (Easy, Normal, Hard) and see how many points you can rack up! The great thing about Scrabble is not only is the game a lot of fun, but it stretches your mind as well. 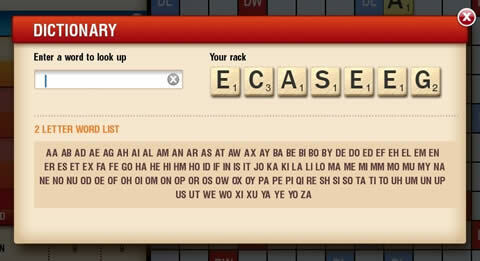 Every game will challenge you to use the best combination of letters in your rack to achieve the highest amount of points in the space available. You only have 7 letters and you only have certain spaces available on the board – what will you do? 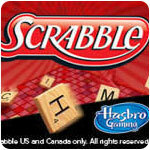 Scrabble is not just for adults, kids can play and learn to build their vocabulary as well. The Easy mode can help young players and a new feature called “Best Word” is an additional help. 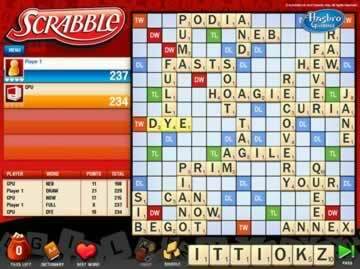 If you choose the “Best Word” option on your turn, the computer will automatically place the optimal letters from your rack on the board in the highest scoring combination possible. This is a great way to learn new words and new strategies! 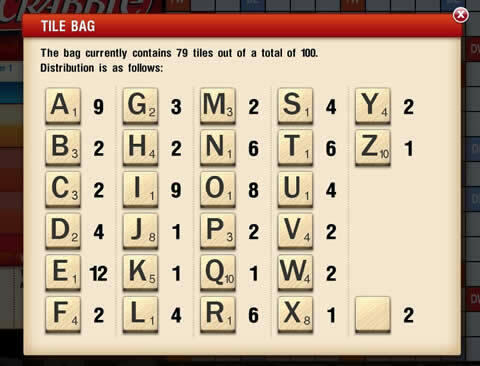 This version of Scrabble also lets you play in “Hot Seat” mode against other people on the same computer. Take turns playing the best letters possible (those waiting for their turn need to keep from peeking at your letter rack). This is a fun way to involve family and friends (especially kids). Another feature in this version is the option to play solo. You don’t play against others and you don’t play against the computer. You can basically take your time creating words and working out strategies without having to deal with an opponent. If waiting for almost all of the letters to be played seems a bit long, you can select some options for a shorter game. Options include first player to 75 or 150 points, an 8 round game, or a 12 round game. 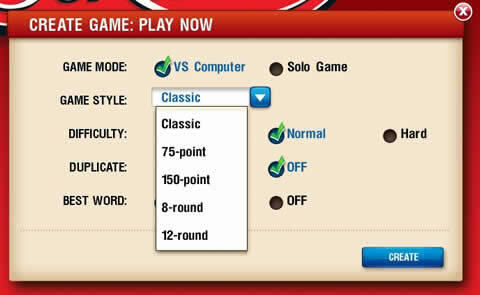 Or you can just leave it on “Classic” and play until one player has played all their available letters. Another interesting feature is stat records. The game will keep track of your highest scoring game, your highest scoring word, your highest scoring turn, your win/loss record, your win percentage, and how many 7 letter words you’ve made. If you want to reset the stats, you can do so at any time. Scrabble also includes several other features to help you in your game. At any time you can see just how many of each letter are available. You can also pull up an electronic dictionary where you can type in words to learn their meaning and even view high scoring two letter combinations (every pro Scrabble player knows these are awesome!). If you can’t seem to find a word to make in your rack, you can click the “Shuffle” button and the computer will automatically rearrange the letters for you. This can help trigger new word ideas you couldn’t quite see before. The game also includes a very nice help section that explains all the rules of Scrabble, have the different game modes and options work, and also gives you a rundown of how much each letter is worth. You shouldn’t have any problem learning the game if you’ve never played before or haven’t played in a long time. Download and Have a Great Time! This Scrabble game comes with a free 60 minute trial for you to enjoy. If you decide you want the full version (which allows you to own the game and removes the trial limit), the cost is fairly low. 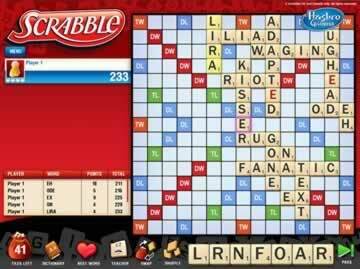 Overall, this is a solid version of Scrabble that you can enjoy on your PC/Windows based desktop or laptop. Have fun and happy scoring! The old crossword board game known as Scrabble has been entertaining board gamers while increasing their vocabulary skills for over 70 years. Its premise is simple, anyone can play it with minimal fuss, and it provides a satisfying and brain-bending challenge. Naturally, it has been adapted for the computer many times over the years. Compared to the rest, how well does PopCap Games' 2013 entry perform? If you were to use one word to describe it, then that word would be "adequate." That's all you could describe it as, for it will never be a substitute for the original board game. If you were expecting fanciful, artistic or technology-pushing graphics, then you must have entered the wrong link. 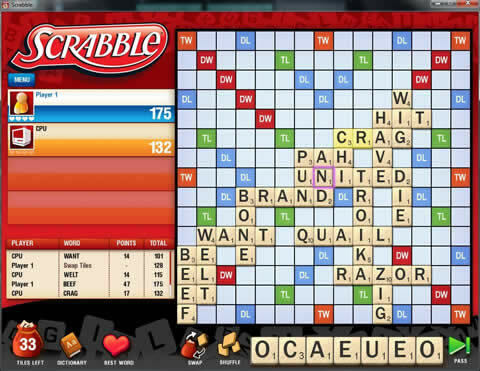 Visually, PopCap's Scrabble won't stay in your mind, but it doesn't have to. The graphics have a simple feel with no visual distractions. They're crisp and clear; you'll be able to identify every level on the screen easily, what squares will double or triple the point value of your words and letters, and what button to press to signify when you want to end your turn. Player scores are recorded automatically and they're all right there on the screen for you to see. There's even a record that displays the last few words spelled out. The screen resolution can be adjusted as well, so the visual-impaired can join in on the action. In terms of audio, a simple jazzy beat will accompany your gameplay. It's not much to talk about and it can get fairly repetitive. Luckily, the volume can be turned down in-game, making it a complete non-issue for those that find it annoying. Unfortunately, there's only one universal option to adjust the volume; you can't fiddle around with separate sliders for the music and sound effects. It's not a big deal, but it still should have been considered. Overall, there's little to complain about the game's presentation. Everything looks how you would expect, it's adjustable in most of the right places, and the interface is clear and concise. Even people who are unfamiliar with computer games should be able to pick Scrabble up with few problems. The inherent beauty of most board games is the flexibility they afford. Players can adopt their own house rules to fine tune the game to their preferences. No digital edition of Scrabble can hope to match that, though PopCap's entry does what it can. Unfortunately, it just doesn't feel like it's enough. 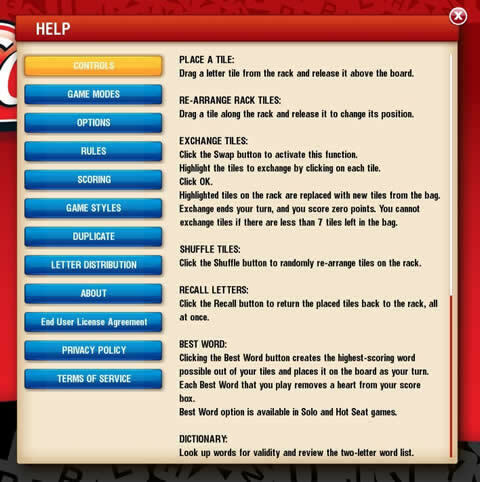 PopCap's Scrabble provides a number of styles for which the game can be played. You can play with all the official rules intact with Classic mode, race to a minimum score with 75-point and 150-point modes, or see how high a score you can get in eight or 12 rounds. You can also decide whether you want to include duplicate words or not. Finally, you can choose your players. Unfortunately, things seem really limited here. Should you opt to challenge the computer, you can only face one at a time. The only thing you can adjust at this point is the difficulty level, of which there are three. You also cannot mix and match human and computer opponents. If you opt to play against another human, then you and up to three others can duke it out in a hotseat game. Sadly, there are no options to challenge other players online or to even form your own LAN network. Four people on one computer is your only option and that is it. It might have been to keep things simple, but this kind of omission makes having the original board game a much more attractive option. 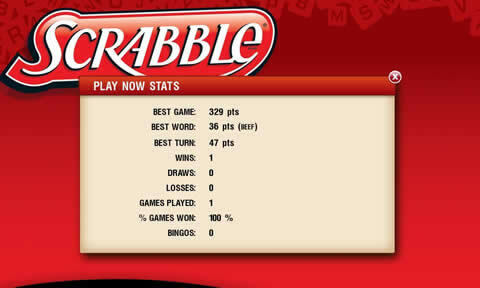 When it comes to actually playing Scrabble on the computer, this game does a decent job of it. Everything is operated via easy drag-and-drop controls. You have complete freedom to arrange your personal row of letters in any way you like, and can place them anywhere on the board, even if their positions are not immediately legal. Once your turn is finished, the game will automatically check to see if all the rules were followed and if the word is valid according to its dictionary. On the surface, it works quite well. Points are recorded by the computer, which helps keep the game flowing at a steady rate. The dictionary is fairly extensive. The AI for computer opponents can actually be pretty sharp at finding words, though it can sometimes feel like it's cheating. Finally, games are saved automatically, so you don't need to complete each one in a single setting. However, all this automation also kind of takes away some of the best parts to the board game. Forget about trying to pass a nonsense term like "kwyjibo" off as a word for a "big, dumb, balding North American ape with no chin and a bad temper" like Bart Simpson. Forget about trying to challenge people for using what you suspect are false words. In PopCap's Scrabble, you either play real words or you don't play at all. Besides that, many of this edition's basic features feel a tad clunky. When it comes to putting letters on and off the board, you can only physically drag them around. You can't just get them out of the way with a single click. Another annoyance is that it can only save one game at a time. If you ever begin a new game, then the previous one will be deleted. For a game made early in the New Tens, this is simply unacceptable. Overall, PopCap's rendition of Scrabble is far from the best. It gets the job done, and it can still be fun to pit your vocabulary skills against your friends or even the computer. Unfortunately, it's missing a lot of strategic options that are available in the original board game and other digital editions. It also suffers from a number of technical issues that really have no right to be there. It's not a terrible product by any stretch of the imagination, but as it is, there are likely better versions of Scrabble to find out there.